Premature infants are at risk for a number of health complications – everything from delayed development and growth to SIDS and breathing problems. But there is one health condition that seems to be more common in premature infants who are fed formula: necrotizing enterocolitis. This condition is the leading cause of death from gastrointestinal diseases among premature infants, but up until recently, scientists knew very little about why it happens or why it’s more common in formula fed preemies. Alexander Penn, a research scientist working in the Microcirculation Laboratory of bioengineering Professor Gert Schmid-Schonbein from UC Sand Diego Jacobs School of Engineering, believes he and his colleagues may be one step closer to understanding the mystery. Through previous studies, Penn and his colleagues had already determined that partially digested food causes the presence of free fatty acids, which can have a “detergent” capacity and damage the cell membranes in the intestines of mature, healthy adult intestines. They also knew that healthy adults and older children have a mucosal barrier in their intestines that helps prevent damage from free fatty acids and that infants have leakier intestines after birth because they lack that same lining, which makes them more susceptible to necrotizing enterocolitis. What they didn’t know is why formula fed infants were more likely to develop the condition, so they “digested” various infant formulas and breast milk in pancreatic enzymes (intestinal fluid) and watched the cells for damage. Necrotizing enterocolitis involves the death of three types of intestinal cells: epithelial cells, which line the intestines; endothelial cells, which line blood vessels; and neutrophils, white blood cells that act as “first responders” when inflammation from trauma occurs in the body. When looking at the cells exposed to infant formulas, researchers found that cellular death occurred, in some cases, as little as five minutes. For example, formula digestion resulted in the death of anywhere from 47 percent to 99 percent of the neutrophils. In contrast, breast milk digestion resulted in the death of only about six percent of neutrophils. This led researchers to believe that breast milk is digested in a slower, more controlled process than formula. The information from this study further supports the “breast is best” campaign. 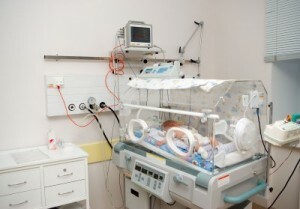 While formula-fed premature infants are at a higher risk, even full-term infants can develop necrotizing enterocolitis. But even when the fatal condition does not occur, the cellular death that occurs with infant formula may pose health complications later on in life. Unfortunately, this means trouble for some neonatal care units. While some have worked hard at encouraging mothers of preemies to breastfeed, there are many situations in which breastfeeding may be extremely challenging (the infant may be too small to handle, the infant’s mouth may be too small to latch on, suckling instincts may not be in place yet, etc.). In other situations, where no mother is present for one reason or another, it may be almost impossible to provide breast milk, unless donor milk (which is often scarce in supply) can be found. Dr. Sharon Taylor, a professor of pediatric medicine at UC San Diego School of Medicine and a pediatric gastroenterologist at Rady Children’s Hospital, San Diego and a colleague on the study says that this study should encourage hospitals and neonatal intensive care units to encourage breastfeeding, even when faced with these difficult situations. She says that consultations and more resources can be given to mothers of infants who are too frail to nurse. One example would be to encourage these mothers to pump breast milk so that it can be fed to the baby through a feeding tube rather than through a bottle or through the breast. Still, there is still and need for an infant formula that doesn’t cause intestinal cellular death. This may help in cases in which breast milk just isn’t a viable option (no mother, mother who has drugs in her system, etc.). The researchers in the study analyzed several formulas, including some of which are specially designed for premature infants, so a new one would likely need to be developed, one that receives special testing to check for the death of intestinal cells.